Tom Welling is one of Hollywood’s brightest stars and talents; he is not just an actor but also a producer, director, and a model. Tom is best known as Clark Kent in the superhero series Smallville which aired from 2001–2011 and as Lt. Marcus Pierce/Cain on Fox drama series Lucifer. Asides from TV series Welling has also appeared in feature films and moved his career forward by taking up jobs as a director and producer. The Welling family moved around quite frequently while he was growing up, thus, Tom Welling lived in a number of States in the U.S like Delaware, Wisconsin and then Michigan where the family finally settled long enough for Tom to attend high school. He attended Okemos High School, Okemos, Michigan, where he wasn’t just a member of the school’s drama group but was also active in the school’s sports team; he played soccer, baseball, and basketball. After high school, he took up a job as a construction worker, before he was discovered by a catalogue camera scout at a party in Nantucket. The scout convinced Tom to try out modeling, he signed up with Louisa Modeling Agency which he modeled for until the year 2000 when he moved over to L.A and began modeling for big names like Calvin Klein, Abercrombie & Fitch, and Tommy Hilfiger. While modeling, Welling still had his eyes on acting and an opportunity came for him to express his range of emotions as he called it, when he was featured in Angela Via’s music video “Picture Perfect” as Vía’s love interest. Welling began getting minor acting roles and continued modeling occasionally. In 2008, he appeared in the May issue of Vogue called Superhero Issue. His major acting role was as Rob Meltzer, (karate teacher) in the second season of CBS legal drama Judging Amy. He originally signed for just three episodes but producers kept him longer after receiving rave reviews from fans. He also got a minor role on UPN’s science fiction sitcom Special Unit 2, and also in the pilot episode of the FOX’s Undeclared. 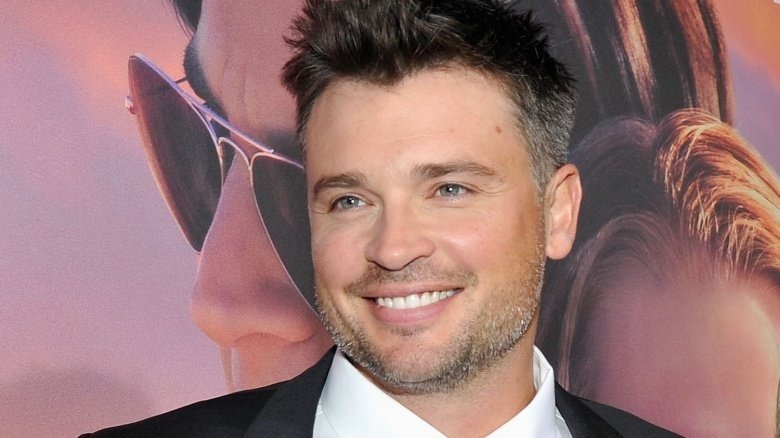 Tom Welling made his feature film debut in 2003 as Charlie Baker, in the family comedy Cheaper by the Dozen alongside Bonnie Hunt, and Steve Martin. In 2005, he played Nick Castle in the horror film – The Fog, the same year, he reprised role as Charlie Baker in Cheaper by the Dozen 2. In 2013 he was among the all-star cast of Peter Landesman’s historical drama Parkland, and in 2014, he starred in Ivan Reitman’s sports drama Draft Day alongside Frank Langella, Kevin Costner, Denis Leary, and Jennifer Garner. Tom’s breakthrough came with his role as Clark Kent in the superhero series Smallville which aired from 2001–2011. Welling revealed in an interview that he turned down the lead role twice before agreeing to take it up, just like Christopher Reeve. Tom Welling was not a Superman fan before then but little did he know that playing Kent would change his career forever. He discovered himself to be an alien with superhuman abilities which he, in turn, uses to save those in danger. He lives his life keeping his abilities a secret and tries to live as normal as possible like every other human. His role in the series has earned him several nominations and awards. In 2001, he was one of People magazine’s “Breakthrough Stars of the year and in 2002, he won Teen Choice Award as “Choice Breakout Star for the year in the male category. In 2009, he won another Teen Choice Award as “Choice TV Actor (Action Adventure)” for his role in Smallville. During the filming of Smallville‘s 9th season, Tom worked behind the scene as a co-executive producer and during the filming of the final season in the fall of 2010, he worked as a full executive producer. Tom Welling also made his directorial debut in 2006 in a season five episode of Smallville entitled Fragile and other episodes like Hydro, Apocalypse, Injustice, Absolute Justice, Patriot and Booster. In 2017, he was cast as Lt. Marcus Pierce/Cain in the third season of Fox drama series Lucifer. In Lucifer, he plays the role of a respected police lieutenant overseeing the work done by Detective Chloe Decker (played by Lauren German), Detective Daniel “Dan” Espinoza (played by Kevin Alejandro, and Ella Lopez (forensic scientist for the LAPD played by Aimee Garcia). Tom then gets revealed to be the immortal Cain; world’s first murderer. He has also been involved behind the camera as an executive producer and a director for CW’s TV series Hellcats, which aired on the network between 2010 and 2011. From his career as a model, actor, producer, and director, Tom Welling has made quite a fortune for himself. He may currently be among the wealthiest in the industry but with a net worth estimated between $14 to $16 million, the actor is certainly living large. The Smallville actor is currently engaged to his girlfriend Jessica Rose Lee. He was previously married to model Jamie White. The couple got married in Martha’s Vineyard in the year 2002 before their family members and friends. In October 2013, White filed for a divorce which was finalized in November 2015.